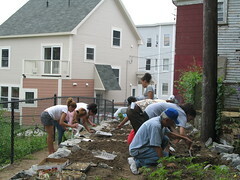 The Union & Mechanic Community Gardens project entails an effort to design and construct community gardens in an underutilized, formerly derelict alleyway in concert with new affordable housing being built on several vacant lots on a block at the intersection of Union and Mechanic Streets in North Lawrence. Born out of a multi-year, multi-project partnership between Groundwork Lawrence and Lawrence CommunityWorks, a local non-profit community development corporation, the project provides an opportunity to explore creative and low-impact redevelopment solutions for vacant lots and underutilized spaces in Lawrence. The Union & Mechanic block is located in Lawrence’s poorest and most densely built North Common neighborhood, an area rife with two and three-family homes, vacant lots and a correspondingly high need for active and passive open space. Five lots in the Union and Mechanic block had lain vacant for over fifteen years and had long been utilized during that time for parking, car maintenance, illegal dumping, and squatter community gardening. In keeping with its mission to construct high-quality affordable housing for low-income residents of Lawrence, CommunityWorks sought site control of these vacant lots and engaged local residents in public forums, or charrettes, about how to best reuse the land. By 2002, it had become clear that residents in the neighborhood desired more affordable housing opportunities and saw great potential for housing construction on these vacant lots. As a result of those discussions, CommunityWorks formulated plans for infill redevelopment of the lots. To avoid displacing the squatter gardeners who had occupied two of the vacant lots with raised garden beds for the past seven years, Groundwork Lawrence worked with Lawrence CommunityWorks to develop a conceptual plan for reclaiming the entire alleyway running through the Union and Mechanic block and along these vacant lots so it could be reused as community garden space, thereby freeing up all the vacant lots for redevelopment.